Happy Easter Everyone! Well…by this point it’s no longer Easter in Louisiana, but we’ve still got a few hours left over here in Hawaii. It’s been a busy two days, but definitely a good two days. God is certainly moving here in Honolulu, and it’s been a blessing to witness it and be an encouragement to it. 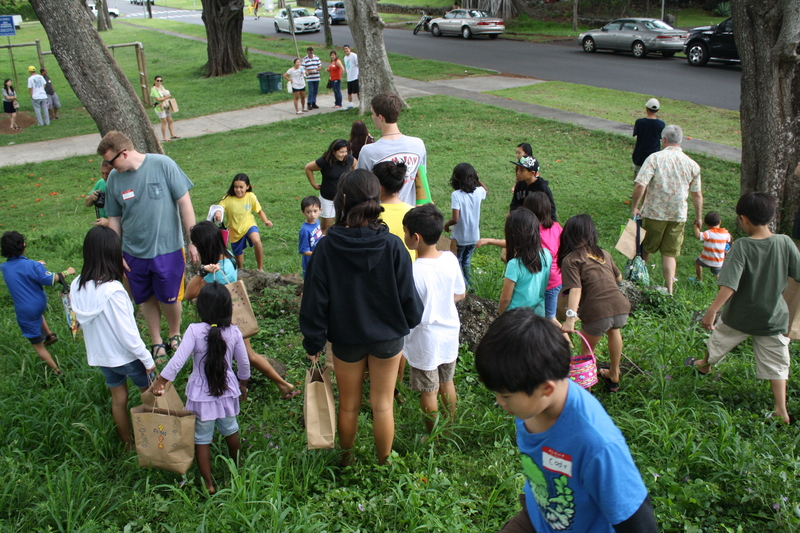 Yesterday (Saturday), we helped out at a Block Party/Easter Egg Hunt at University Avenue Baptist Church. There were roughly 40 children from the surrounding neighborhood, along with their parents, making a total of about 60 visitors to the church. We had a big Hawaiian fellowship with a 1200 egg Easter egg hunt, a Hawaiian family meal, a number of games and crafts, and of course Shave Ice (Snow Balls to us south Louisianians). We were able to be the facilitators of the event so that the church leaders could make connections with visitors. Today we split up and went to two different Easter Sunday morning church services. Half of the group went to a sunrise service at Aina Haina Baptist church, where we’ll return to do some grounds work on Wednesday. The other half of the group participated in a drama in the University Avenue Baptist church service as a sort of follow up to our work there yesterday. In addition to those two churches, there was a third service right next door to the BCM in a house church that Arjay (the BCM director here) pastors. It is always refreshing and encouraging to see so many people gathered in praise and worship half a world away from home. For two different churches, today was special beyond just the celebration of Easter. After the service at Aina Haina Baptist this morning we were able to go to the beach with the church family and celebrate the Baptism of their newest member: a twenty something year old woman named Darlyn. 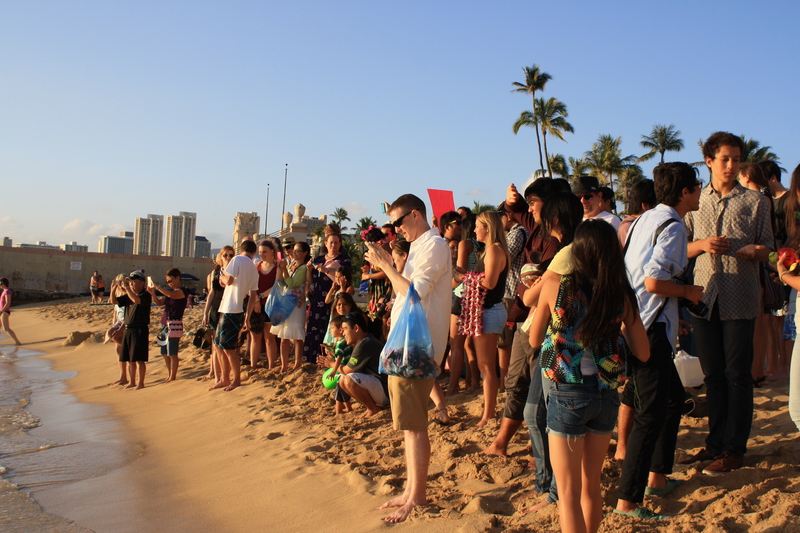 This evening we met at the beach just before sunset with a large group from Arjay’s church to celebrate the Baptism of five different girls: Shelly, Hawaii, Aurora, Candace, and Katie. From all the experiences we’ve had over the past two days, spending time with so many church folks here in Hawaii, the major thing that has stuck out is the intense familial love that everyone has for each other. All six of the girls that were baptized today said that one of the biggest reasons that the church had an impact on them was that it felt like a big family and that they knew that each of them genuinely cared for each other. So often I think we get into the typical American mindset of wanting to operate everything like a business, and that has a tendency to trickle into the way we do church. We focus on ways to hook people in or convince them to join us, and really the best way to reach people is by showing them the love of Christ and spreading the love that He pours into us. The Gospel has the power to change lives, and the basis of the Gospel is God’s love for all of humanity (John 3:16, anyone?). We as humans have an innate desire to be loved and to feel like we belong, and nothing can fill those voids better than the love of Christ and the love of the church body. So think about that today as you go about your life. Look for ways to show people that you see them the way God sees them: as His dearly loved children. And find opportunities to genuinely pour that love into their lives. Without the relationship and trust that come from true, Godly love, no meaningful life change will last; Paul pretty much sums it up in 1 Corinthians 13:1-3. Without love our attempts to share the Gospel are nothing, and without love we are nothing. Aloha from Hawaii! For all of you back on the mainland, you can rest easily knowing that we made it here safely (after a nice twelve hours worth of flying). Though we haven’t been here for more than a day, the differences between here and the mainland are striking. Hawaii is known as the “Crossroads of the Pacific” because there are cultural influences from all across the Pacific Ocean. The ethnic makeup includes native Hawaiians, Chinese, Japanese, Korean, Vietnamese, other Southeast Asians, and all of the ethnicities we have on the mainland. The island of Oahu and the city of Honolulu have close to 1 million people from all walks of life: it’s commonplace here to walk through the streets and see a group of homeless people on one corner and a multi-million dollar house on the next. Across the Island of Oahu, there are 6 different college campuses that the BCM here reaches out to. Of the over 65,000 students, between 1% and 2% claim Christ as their savior, so they definitely have their work cut out for them here. To give you an idea of where we will be staying, I posted a picture of the BCM’s dorm above. 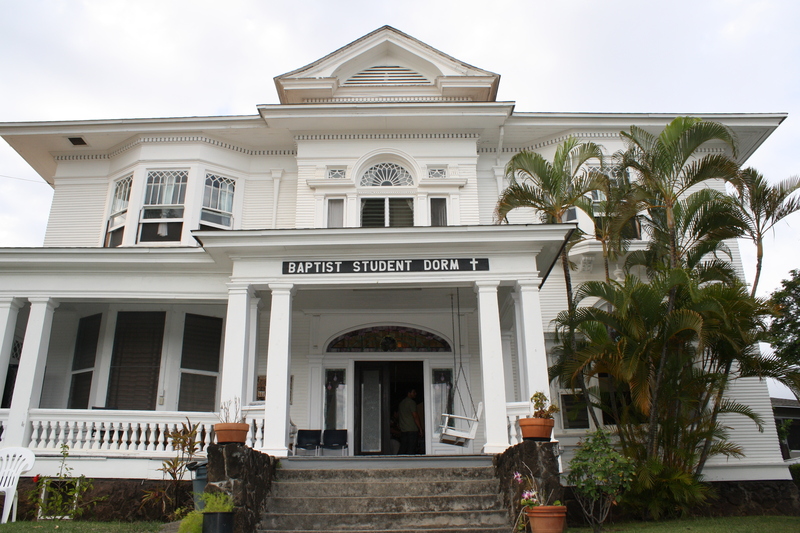 They have an old plantation house that houses around 20 students who live and work at the BCM here. Today, pray we have energy and are not jet lagged from the flight. Pray that we can encourage the people of University Avenue Baptist Church to reach out to their community in spread Christ in this lost place. And pray for the BCM here at the University of Hawaii in their mission to reach out to all of those lost students. Mahalo FBC, we love you!